June 8, 2018 will pass without much care. This Friday, though, will not be the final day of the work week, but few will be upset by the fact that tomorrow they must again to go to work. Typical parties for Friday will continue to happen almost everywhere. If you belong to the category of people who avoid them, we can assume that you have missed a lot. The events on the eve of the working Sabbath will be endowed with a special charm, which will greatly please single people. .
Aries will spend this Friday without major victories. At the finale of the work week, you will be occupied solely with something that has nothing to do with your career. In the evening you will rush to where a person who is especially dear to you is waiting. Anyone watching this relationship blossom will be amazed, as you and your new partner sensitively, touchingly and carefully treat this connection. This will be the same passion that is written about in romance novels. Taurus today will give up resisting changes in their personal living space. And, this is at a time when your beloved partner is determined to modify the interior, using the services of professional designers. Before giving a definitive "no" to such projects, think again. Perhaps the most proper thing for you is to allow a professional to evaluate your space and offer you options for how it might look after updates. Gemini today will lose in a conversation with their other half. Your partner will refuse to admit that they were fundamentally wrong when talking to one of your parents. If you honor the family and do not want your parents to continue to be treated so disrespectfully, state this clearly. Do everything to make your partner realize that you will not live with a person who has no idea of respect and morals. Cancers on June 8, 2018 should not hide your heart behind hundreds of locks. First, determine who or what makes you so much afraid of a new love affair. The person who suggested that you start a new romance is worthy of respect, admiration, and the right to be with you. The sooner you admit it, the better for you. That "diamond" that offered you a chance will not remain alone. There is a risk that while you hesitate with your answers, someone will scoop up your diamond. Leos today will be guided by vanity and selfishness. Because of them, you venture to make a deal with your own conscience. In order to become famous, you will set up one of your friends or relatives. Success will come to you, but the price you paid for it will be prohibitive. By this evening you will ask yourself - do I really need this success, if I lost a loved one because of it? You should determine this before you act. 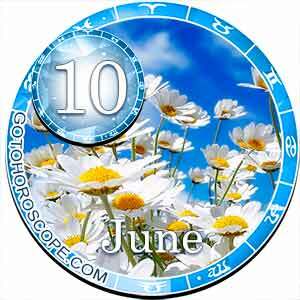 Virgo on June 8, 2018 will not find it easy to understand the true intentions of his second half. They will hint that they want to spend the next weekend alone with you, without the distraction of anyone. However, as soon as you offer your loved one a specific itinerary for this romantic trip, they will change their mind about going. Give your partner the right to ponder for a couple of minutes what their ideal weekend scenario looks like (maybe they have other ideas). Libra will not experience joy or anxiety today. Remembering that on Saturday you will have to work again, you will refuse to attend a traditional Friday party at the house of your best friend. This evening you will be alone with some video project. From this you will not any get rich food for thought, and your intellectual power is unlikely to become greater from this show. So be it. Sometimes it is useful to think about nothing, giving yourself intellectual relaxation. Scorpios today will determine for themselves a new life plan for the near future. The number one item of this plan will be a very expensive purchase, which you will save for today. Going into the over-economical mode, you even refuse to attend a party which you were anticipating, with a sinking heart. You will look at it this way - no need to spend money on my hair, attire, or expensive cocktails, if all this money can be sent to the piggy bank. Today it will be typical for Sagittarians to give an elaborate answer to the most simple questions. Thus, you will not pursue any goals. Expressing your thoughts in vague phrases, you will be in a distracted mood when you wake up. It will not lead you to anything terrible. However, do not forget to keep track of whether you have firmly locked the door, or whether your wallet and other important things are stored in a safe place, which you can forget about because of the distracted mood. Capricorns will spend June 8th separated from the bustle. You will perceive what is happening around you, like a movie or some strange TV show, run by creative directors. A cold-blooded look from the outside will help you determine how and at what particular moment you should act. You will be the winner by the end of this day, while your less-nimble colleagues will lose out (your income will increase, and theirs will become much lower). Aquarius will spend this day doing business with their family. You want to devote all your free time to your household, remembering that in the last few days you did not give them hugs, love and care. You even prepare a pleasant surprise for your relatives (most likely, we are talking about a small home party). This event will please both older and younger members of your family, as representatives of all generations will gather at it. Pisces today will acquire a very useful object, capable of making household affairs less tedious. However, not all your relatives will like this thing. Representatives of the older generation will begin to grumble unhappily, saying they are used to coping without this miracle-thing. Do not try to convince them that this device is really capable of a lot. Your family will understand for themselves as soon as they see all the possibilities of your purchase in practice.